It doesn’t take an expert to see that things are very wrong with the current legal status of cannabis. Our government says there is no accepted medical use for it, yet it holds a patent (#6630507) for medicinal use of cannabinoids as antioxidants and neuroprotectants, and it distributes canisters of rolled joints to a few select patients in the Compassionate Use Program. Sativex, a whole plant extract that is administered sublingually, is being approved in other countries as a prescription drug, but not in the United States. 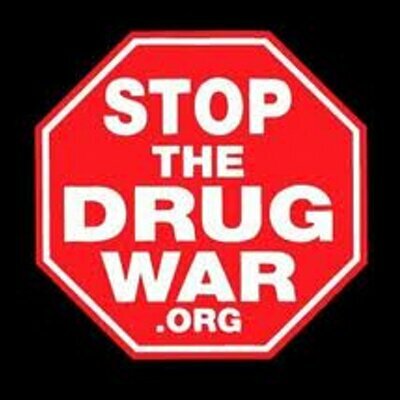 Our government says it needs proof that marijuana is in fact therapeutic, though it makes this impossible to prove, with its monopoly on substandard plant material from the one FDA-approved farm in Mississippi, and the maze of federal approval required for research to proceed. FDA requires NIDA to sign off on cannabis studies, a hoop that no other drug researchers need jump through. Palo Alto City Council Unanimously Approves Medical Marijuana Dispensaries. Will Voters Agree? In a display of democracy at work, voters will soon be able to decide if Palo Alto, California – the home of Stanford University and birthplace of tech giants such as Facebook and Google – will become the first city on the San Francisco Bay Peninsula to allow medical marijuana dispensaries. The city is determining whether to allow 3 dispensaries to operate within its jurisdiction. Three weeks into its launch, there are already eight petitions that will warrant a response from the White House per its own rules. 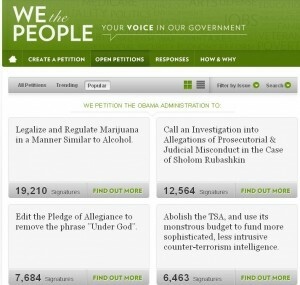 The site appears to have attracted civil libertarians, pro-marijuana advocates, and atheists. Over just two days since the Forbes article, quoted above, the number of petitioners has nearly doubled from 20,000; today approaching 40,000. Add your vote NOW, and spread this link far and wide! Now is the time to bring justice, logic, and common sense to marijuana regulation. 1. Click and sign the petition. 2. Share with all your friends. 3. Let's do this right NOW. Knowledge is Power. Resisting ignorance is never futile. Watch the full episode. See more Ken Burns. Prohibition turned law-abiding citizens into criminals, made a mockery of the justice system, caused illicit drinking to seem glamorous and fun, encouraged neighborhood gangs to become national crime syndicates, permitted government officials to bend and sometimes even break the law, and fostered cynicism and hypocrisy that corroded the social contract all across the country. "How the hell did that happen? How does a freedom loving people, a nation that's built on individual rights and liberties decide -- in one kind of, crazed moment it almost seems -- that we can tell people how to live their lives?" Daniel Okrent, author, Last Call: The Rise and Fall of Prohibition. The obvious echo will be about drugs. You will hear “if only” in many variants this fall — as in, if only the most popular of illicit substances were brought out of criminal shadows to be legalized and taxed. But the film and book are much more instructive on the political fevers of the early 21st century, particularly those aroused by monomaniacal anti-tax pressure groups and their foot soldiers, the increasingly unpopular Tea Party. Lynn Novick: "Prohibition didn't happen overnight." Legalizing Pot: Will It End the Mexican DrugCartels? Willie Nelson's Texas prosecutor —a 78-year-old fan, who plans to let the country singer off on a marijuana charge as long as he performs a song in court (and pays a fine) —wants to decriminalize pot. Hudspeth County Attorney C.R. "Kit" Bramblett favors a bill before the Texas Legislature that would end jail sentences for minor marijuana possession. "That makes sense to me," he told the Raw Story website last week. Bramblett is otherwise a fairly conservative guy who wouldn't want to legalize heroin or cocaine. But his experience as a prosecutor has convinced him not to seek jail time on small possessions charges, and the very fact that the Texas Legislature is considering a bill to decriminalize pot suggests a way forward in the failed American war on drugs. "I may not like it," Hudspeth told Raw Story, "but can't no one can stop people from smoking it no matter how hard you try. Besides, people on that dang weed aren't as senseless as on whiskey, I can tell you that much."